K104's DeDe McGuire is Ready for her Holiday Party and Wants You There! 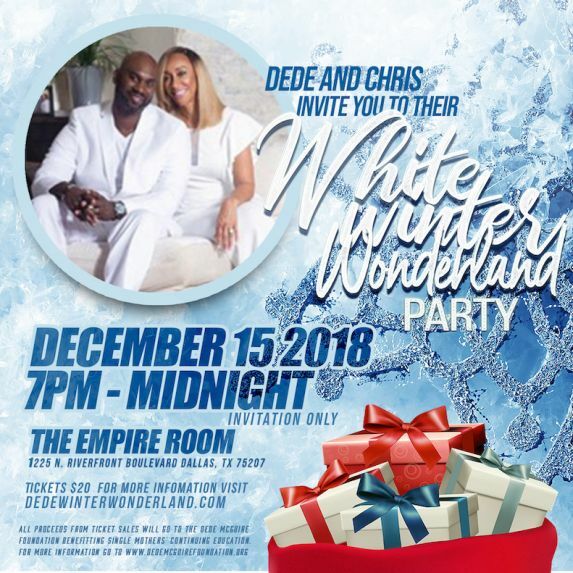 DALLAS - Dec. 10, 2018 - PRLog -- This Saturday DeDe McGuire and her husband Chris will host their annual White Winter Wonderland at The Empire Room. K104's morning show host decided she wanted to make her annual holiday party bigger and better by opening it to the city of Dallas and its notable public figures. The season of giving; McGuire plans to donate all the ticket sales proceeds to The DeDe McGuire Foundation benefitting single mothers going back to school to complete their education. DeDe's Winter Wonderland will take place Saturday, December 15th 2018 from 7pm to Midnight. The Empire Room will host and Hendricks will provide the drinks! Come out and start your holiday season right with a great party, great people for a great cause! Tickets available at www.dedewinterwonderland.com. DeDe would like to thank all of the events sponsors and organizers including For Beauty Sake, Hendricks, My Fast Signs, Phase Global Management, and DiamondMPR. The DeDe McGuire Foundation creates stronger families and communities by strengthening the role of women and mothers by offering scholarships to women whose higher education was interrupted or derailed because of family, personal obligations or financial distress.The Foundation's primary goal is to assist low-income women and mothers furthering their education with financial means. The foundation helps women obtain a second chance.